For the comic on Friday, I had to generate a color gradient between the full-brightness daylight color in the third frame and the nighttime darkness color in the fourth frame. Since the point of the comic was to adjust the brightness using a slider with 20 positions, I needed 40 colors (including the 2 starting colors) so that when the brightness was all the way down both frames would have the same background. They would meet in the middle. It was actually a very nice comic. On the right you can see the frames with the color gradients, but the real comic is interactive - go play around with it if you haven't yet! Here is the function. Calling it should be self-explanatory. Note that the colorCount parameter will be the total size of the output array INCLUDING the start and end colors. One thing that I noticed is that for colorCount values greater than 13 the final color was not quite the requested final color. Rounding error I suppose. That's why I explicitly set the last element in the return array to the end color, if you were wondering. ...which produces the following output on a web page. Beautiful, isn't it? Today's comic, on the other hand, contains absolutely nothing of any technical interest. You should still read it though. 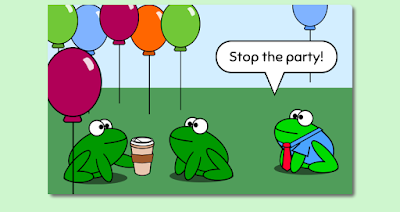 And if you haven't read all the other Amphibian.com comics, what are you waiting for? They don't take that long to read. Start today!